First time in Nice? 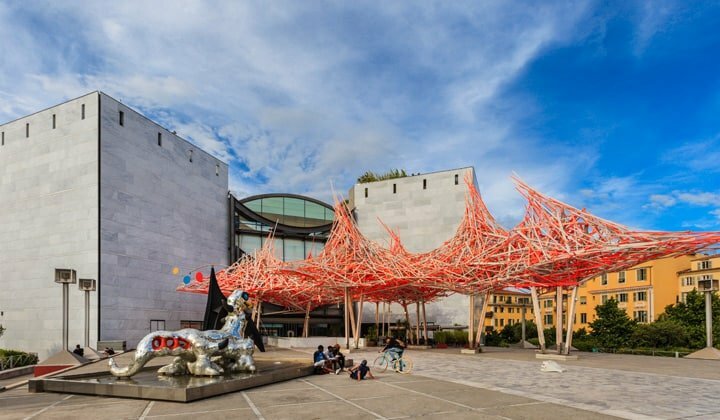 Then our gay Nice city guide page is for you. 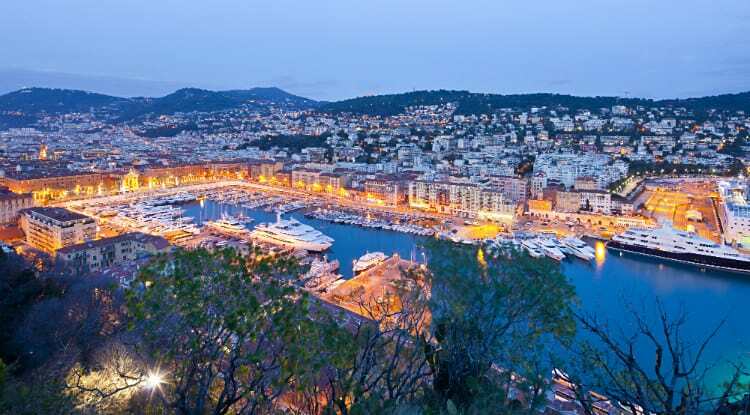 Nice, capital of the Côte d’Azur, is one of the largest cities on the French Riviera. This sun-kissed holiday destination attracts 5 million travellers from around the world drawn by the sunshine, French culture, deep-blue Mediterranean waters, excellent cuisine and charming picturesque squares filled with cafés, restaurants and shops. Stroll along the palm-lined Promenade des Anglais looking out over the Baie des Anges (Bay of Angels), relax on pebbled coastlines, wander around the cobbled streets of Old Town, take in the sights of the beautiful Cours Saleya flower market, enjoy refined French gastronomy, admire the rich cultural pickings in museums and explore the city’s vibrant nightlife. 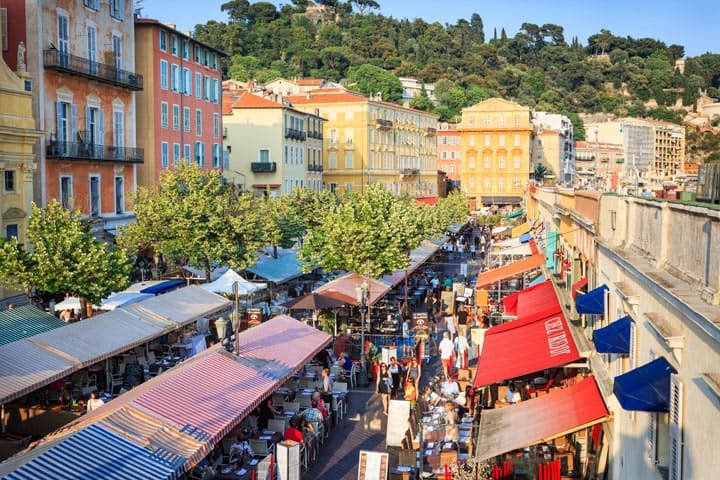 Nice has a lively gay scene that is one of the largest in France (outside of Paris). The city attracts a huge number of gay visitors during the summer months. Many gay bars, gay nightclubs and gay saunas are located in the Old Town area (Vieux Nice). Other gay-popular venues are located near the Promenade. Nice Côte d’Azur Airport is one of the busiest in France, serving both Nice and nearby Monaco with numerous budget airline connections across Europe. A number of direct longer distant routes are available (including Dubai and New York). The airport is located 6 km from Nice city centre at the western end of the Baie des Anges. An Airport Express Bus service provides shuttle services to and from Nice city centre (railway station) for €6. Bus 98 goes from the airport to Nice Old Town. Bus 99 heads to the Gare SNCF train station. Both also cost €6. Taxis are also available and will cost around €30 each way. Nice has excellent train connections to other parts of France and some Italian cities. A high-speed TGV service is available to Paris (6 hours). Most of the historical sights, shops and gay nightlife are located within Nice’s city centre, which has a walking radius of less than 30 minutes. There is an extensive network of buses and a trams. The Vélo Blu self-service bicycle system has 120 pick up and drop off points and 34km of cycle paths. Bikes can be hired from just 1 Euro per day. Taxis can also be found everywhere – but can be expensive. 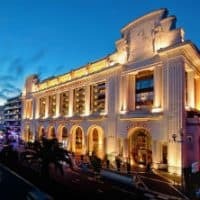 There are many excellent hotels near Promenade des Anglais, Rue de France and Vieux Nice (Old Town). These areas are popular with gay tourists and offer a great base to explore the beaches, city attractions and gay nightlife. 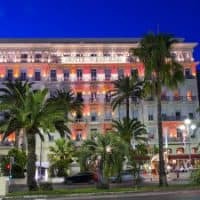 For some of the best hotel selections in Nice for gay travellers, visit our Gay Nice Hotels page. The Old Town – home to the cathedral, medieval streets and stunning architecture. Picturesque cobbled squares, a typically-French cafe culture, boutique shops, museums, art galleries can all be found here. Castle Hill – offers stunning panoramic views over the city. The Opera House, the Museum of Modern & Contemporary Art and the Massena Museum of Art & History are also among some of the city’s major attractions. Check out the Roman heritage of Cimiez to the north of the centre and the archaeological site of Terra Amata on the slopes of Mount Boron. Enjoying a mild Mediterranean climate for much of the year, Nice is a destination for sun seekers and beach lovers looking for a getaway on the French Riviera. The warm waters are turquoise and the skies are blue for much of the year. Average temperatures are over 20°C, frequently reaching 30°C. Winter months are between 11°C and 17°C. France is a Euro area country. Cash dispensers are widely available. Credit and debit cards are widely accepted. Hotels, banks and some local businesses also operate foreign exchange desks.